We’re only a few weeks into 2019, but January has already brought some interesting search upgrades and digital marketing announcements. Want to give your business a head start this year? Here are the four key updates you’ll want to be aware of. A partnership between Google and WordPress/Automattic will launch a new affordable publishing system called Newspack. The platform will include access to WordPress plugins and built-in revenue generating integrations to allow small and medium sized news organisations to focus on what they do best, covering the news stories, rather than worry about web design or complex management systems. Together with Spirited Media and News Revenue Hub, Automattic hopes to further understand the business impact of news features. With a US$1.2 million investment from Google and an additional US$1 million in funding, development of Newspack will begin in the next few weeks. Expect to see the platform available worldwide later this year. Find out more here. Google’s new activity cards are showing related activity at the top of search engine results pages. For certain searches, you can now click and expand activity cards that show previous results from similar searches. An important aspect of this feature is organisation, as users can save search results to a collection to view later. Deleting unwanted results is just as simple to do. Although the activity cards appear above all results, even sponsored listings, it’s too soon to determine how this could impact SEO and user searching habits. Overall, the update brings a sense of transparency, and increases the usefulness and accessibility of a user’s search history. Read more here. Google’s Senior Webmaster Trends Analyst, John Mueller, has revealed that mobile usability is not related to mobile-first indexing, contrary to what Search Console indicates. 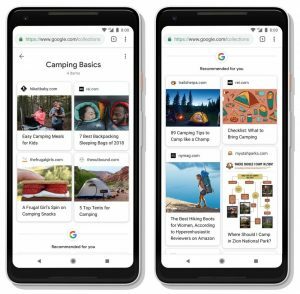 Any text that can be viewed on a mobile device and crawled by Google is added to mobile-first indexing, regardless of how easy it is to navigate. The best example Mueller gave were PDF files, which are notoriously difficult to read on smartphones. This means that Search Console reports and Google’s mobile usability test alone are not reliable indicators of whether a page is ready for mobile-first indexing. Learn more here.